The Holiday House "THE TOWER OF THE SUN" is located in Mazara del Vallo, Trapani, in the Tyrrhenian Avenue at the corner of Via Bessarion (Contrada Tonnarella, area beaches) and is about 400 meters from the beach. 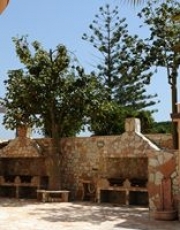 Vacation house “LA TORRE DEL SOLE” is located in Mazara del Vallo in the province of Trapani. It is 400 meters far from the Tonnarella Beach and 1500 meters away from Italy’s biggest fishing harbor. The building was completely modernized following all the health and hazard regulations. It’s made of two buildings: the lower one has 2 two-room apartments and 3 one-room apartment. Once you arrive, you can easily check out the particular tower in which you can find our reception, as well as other rooms. It has 9 one-room and two-room apartments. Two of these have access for disabled people. Each room is defined by a color instead of a number in order to let customers choose the color they desire. Each room has a kitchenette (including kitchen items) with fridge, microwave, table, chairs, TV, internet wifi, washing machine (only in the two-room apartments) and independent air conditioning. The hot water is provided by solar panels. Bedroom and bathroom linens are provided. The comfortable bathroom, has an entrance room, shower, hairdryer and cabinets for personal belongings. The high quality shutters have thermal insulation, and are perfectly secure and sound proof. Our building is refined in stone, which also provides a soundproof but still familiar environment. The solid-wood furniture and doors, painted with water-based pigments, makes your stay secure and healthy. The second floor leads to the beautiful solarium-terrace, which overlooks the breathtaking view of Mazara sea and it’s amazing sunsets. You can tan up while relaxing in a deckchair. The solarium provides shade as well, while enjoying a lovely sea breeze. If the sun gets to hot, the outdoor showers could be a refreshing idea. You can enjoy dinner cooking for yourself in your apartment or using our barbecues provided in the backyard as well as going out for a fancy restaurant. Whatever will be your decision we care to give you all the possibilities in order to make your stay as much as possible. On the ground floor there is a porch with a TV and a drink dispenser to socialize with other guests. There is a big store in front of our vacation house where you can find everything you need so cheap! If you wish to take a ride around Sicilian countryside, we will offer you the possibility to rent a bike or a car. Your holiday dream is waiting for you, Sicilian history and spectacular beaches will surprise you providing an excellent and unique vacation, let the Mediterranean’s soul transport you in one of most incredible experience of your life. beach beds, furniture and chairs, parking on the square lit. - Rental cars, motorcycles, bikes, boats and rafts. - Free transfer to and from the airport (Palermo or Trapani). -From Palermo take highway A29 Palermo-Mazara del Vallo, Mazara del Vallo direction. At the end of the motorway continue straight ahead, without turning to Mazara center, the State Route 115, towards Trapani-Marsala, for about 900 meters. At the traffic lights, after 200 meters, turn left, following signs for Mazara del Vallo. You are now on Via Mario Fani, along it, passing the level crossing, until the first traffic light. Go straight until you reach a second traffic light, after which, turning right you will end up being Bessarion. Finally, take this road on the left side until you find the number 193.